Get up to $500 Back with new Rugged Ridge Sale at CARiD! Jeep & 4x4 Vehicles for sale If it aint atleast 4x4, post in the Misc. Items For sale area. Whether you're looking to customize your Jeep, make it even more capable, or replace some damaged or non-functioning parts, Rugged Ridge has got you covered. Well-known among Jeep owners and off-road enthusiasts, this brand offers over 3,000 Jeep parts for any application you have in mind. Their products are designed to protect you and your Jeep and make sure you can handle any obstacle out on the trail and make it back. Every part is designed, manufactured, tested, fitted, and tested again to make sure it’s perfected before it goes to you. Today we are back with new Rugged Ridge Sale! Purchase Rugged Ridge products and GET up to $500 Cash Back. Get the most out of your Jeep with Rugged Ridge. Act now, this limited time offer ends on April 30, 2019. Please complete the following PDF to get your money back. Rugged Ridge Sale at CARiD - Get 10% OFF! New wheels offer from Rugged Ridge - Get $300 Back with a set of 5 Wheels! Rugged Ridge Promotion at CARiD - up to $150 Cash Back! 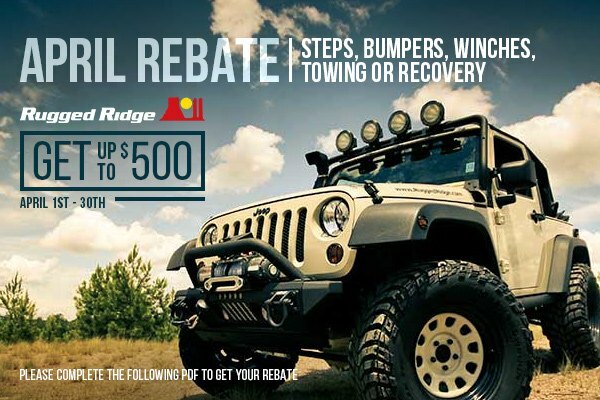 Quick Reply: Get up to $500 Back with new Rugged Ridge Sale at CARiD!